It was huge and purple. The massive construction soared more than 80 feet into the air and throbbed in time with the lights and music. I stood there, staring at it trying to understand what the problem was. No, it wasn’t traditional but when the light show came on and the music blasted, it was an amazing spectacle to behold. 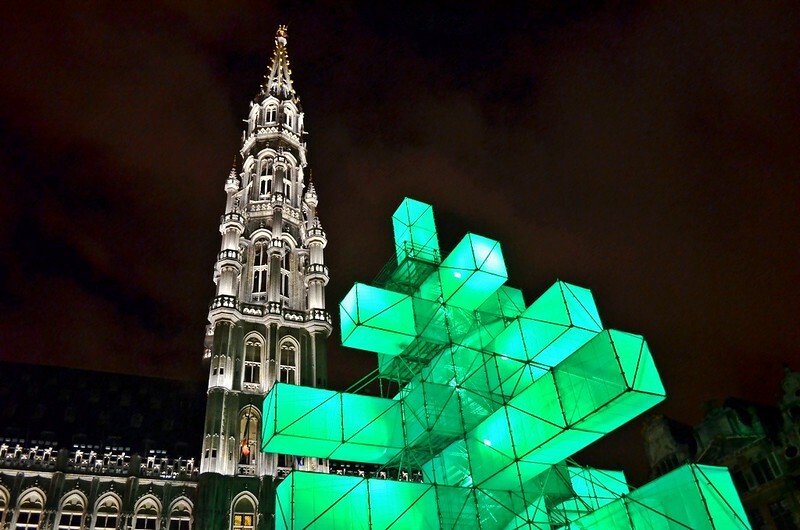 It was hard for me to believe that this decidedly modern Christmas tree was at the root of so much angst in Brussels. 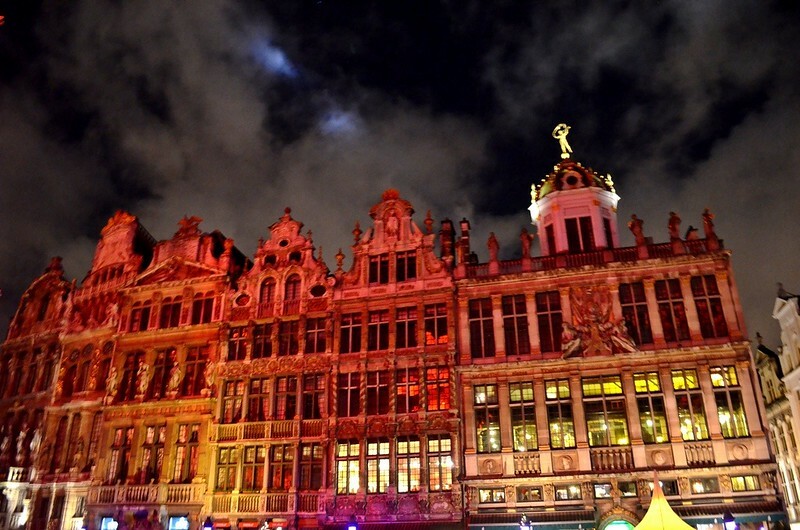 In December 2011, my partner and I spent the Christmas holidays in the Belgian capital and loved being part of the festive spirit. In the center of town at the massive Grand Place was an enormous pine tree, decked out for the holiday season. When we returned in 2012 though that traditional tree had been replaced by something new, contemporary, different but amazing nonetheless. 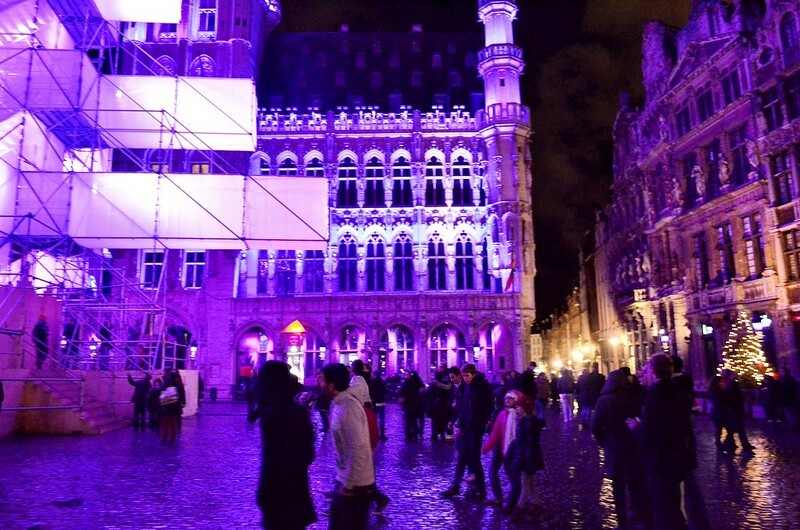 Every year Brussels celebrates the holiday season with a month-long winter festival that is one of the best I’ve seen. Rows upon rows of merchants selling everything from mulled wine to handmade soaps line the streets and everyone is out strolling with loved ones in tow. 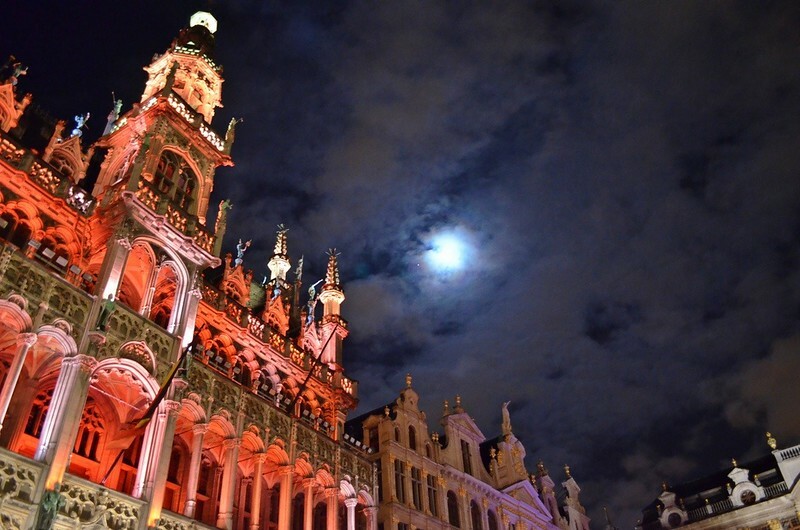 Every night during the festival the Grand Place transforms into an open air light and music show, a brief interlude that never fails to amaze and entertain. This is where the tree controversy comes in. 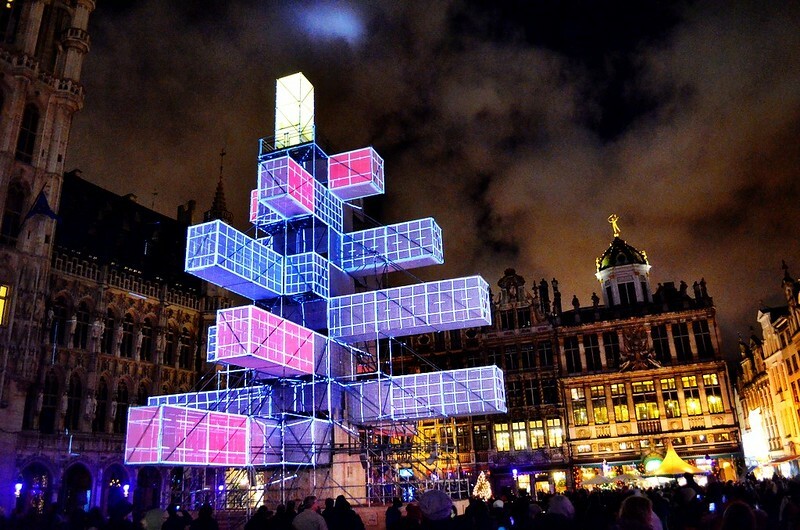 Not surprisingly, the people of Brussels have been somewhat wary of the change from a big, bright traditional Christmas tree to an even bigger and brighter modern version. My lack of surprise isn’t a slight against the Belgian people; it’s just human nature. People dislike and distrust change and you can see that in every corner of the globe. After some research though I was a little surprised at the undertones of the controversy, which smack of racism, something I wouldn’t have expected in one of my favorite European countries. Like many other countries in Europe though, Belgium has seen a rapid and sudden change in their demographics in the last 10-20 years, and such shifts always strike fear into the hearts of many. People are distrustful of new cultures by nature and when coupled with a down economy, tend to blame them for their troubles. You can see this trend pop up throughout the Western world repeatedly over the centuries. It’s nothing new, but it has made Belgians start to consider what it is exactly that makes them Belgian. What really surprised me though was that the average person didn’t seem to understand what the tree was really being used for. They knew it was there in the Grand Place, they knew it was modern and most knew that they didn’t like it. But they’d never seen a clip of the tree in action during the light show, in its full glory. I can’t believe that the local news hasn’t showed what the reality of the situation is and I hope they haven’t been feeding into baseless fear. What does the tree mean for Belgium? Not much, not the tree itself. It is still a tree after all in shape if nothing else, no traditions have been halted and the celebrations persist. I have to believe the change was done not in a nod towards multiculturalism, but towards facilitating a better light show and to paint Brussels in a more modern light, to escape specters of staleness and being too stodgy. But the tree has reignited a debate in the country and it’s something it will have to deal with in the future. Like many other nations before it, Belgium has to learn how to accommodate new people while maintaining the traditions and culture that make Belgium unique. So what did I think of the tree? I loved it. At first I was taken a little aback, it looks like one of those horrible fixtures one sees in the opening ceremonies of the Olympics. But after watching the light show for the first time I was hooked. The organizers of the event have so much more creative license now than before and the stunning results are amazing to watch in person. There’s still a tree, it’s still in celebration of Christmas and I think people should have realized the real intent rather than invent more nefarious ones. But that’s just me. Here’s a brief video of the tree in action during the light show, tell me what you think. 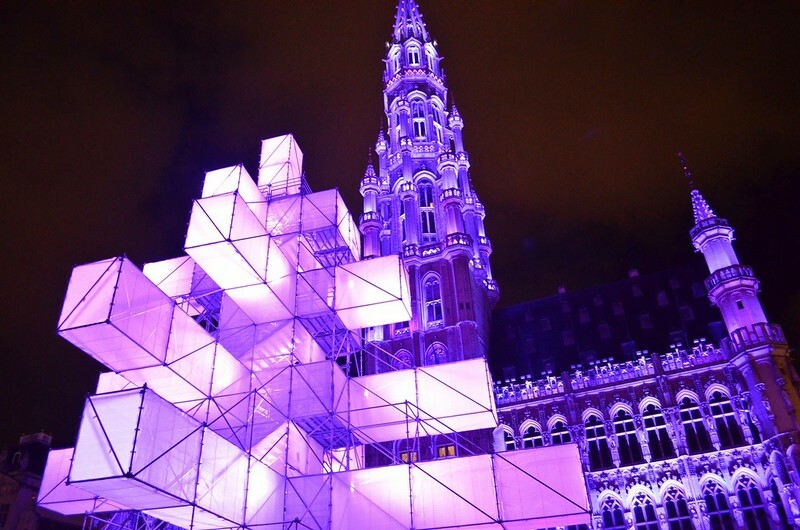 Brussels Winter Light Show from Matt long on Vimeo. we actually still don’t know if the tree has been chosen just for putting on a better light show or if, as some claim, the city also wanted to avoid offending other religions than Christianity by choosing a non-traditional tree. I didn’t make it to Brussels’ Christmas market this year, so I didn’t see for myself and even if I would’ve, how much I would’ve liked it would’ve been based on personal preferences, but yes, the debate on multiculturalism and certainly on specific religions in Belgium is wide open. I remember reading about the kerfuffle over the tree and thinking it was just the stupidest thing. Another “symptom” of the nonexistant war on Christmas that is so popular here in America. I don’t know a single non-christian person who is offended by Christmas trees. Anyways it looks really cool! This is an issue that reared itself in Sydney Australia nearly a decade ago now. In 2004 the then newly elected Lord Mayor of the city did an about face on all traditional decorations and replaced them with uninspiring, secular displays with no reference to any religion and for a short time even dropped the word Christmas altogether. She made it clear at the time that this was so the council was not seen to promote one religion over any other. Cost-cutting as meant a majority of retailers have done the same thing (if they acknowledge it at all). So while December in Sydney looks festive enough, it mostly lacks that romanticize Christmas feel one associates with that period of the year in a historically Christian country. I would hate to see cities on the continent eventually follow suit. Well it’s still a Christmas tree. There’s no denying that when you see it. I think they just wanted to modernize, but clearly it has not been a popular decision. I was in Brussels right before Christmas and saw the new tree. During the day, when the light show wasn’t going on, I just thought it was some strange modern art display, but at night, the first thing that came to mind was “wow!” Definitely a unique and fun take on traditional Christmas festivities. From a visitor’s perspective, this is something that definitely made Brussels stand out from the other cities I visited and really reflected a vibrant, modern and young city. Plus, the contrast between the modern tree and classic architecture in Grand Place made for some great photos.